Andrew and Catherine Scott (cousins on the Growdon side of the family) are cycling around in South America, and have started a blog Two Scotts on the trot, where you can follow their adventures. Thursday 20th August saw two firsts. We obtained our first hitchhike (owing to a nasty headwind and dry heat) with a friendly gentleman, an electrical engineer, who was heading as far as Wanda, which happened to be a perfect destination. 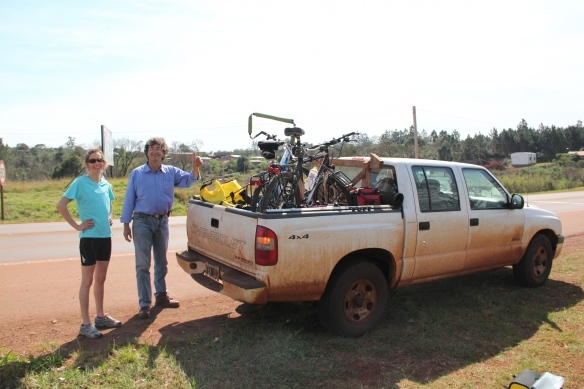 It gave us enough distance to cycle to Iguazu, but without having to spend a week getting there. The drive also turned into a Spanish lesson. We unloaded in Wanda and gratefully thanked him. It was then we noticed Andrew’s bicycle’s back tyre was completely flat. Our first puncture. I don’t know if this Marty Growdon is related to us, or which branch of the Growdon family he belongs to, but maybe someone will know. July 22, 2008. Originally, Westwood resident Marty Growdon committed to participate in AIDS Lifecycle 7 for a week of cycling along the California Coast with his son, Mark, the first week of June. However, when his son was injured while training and had to drop out, Growdon decided to ride alone. Although he didn�t have a riding buddy, it was not a lonely endeavor. The seven-day, 545- mile ride from San Francisco to Los Angeles had 2,500 participants and 500 support staff. According to the event mission statement, its purpose in part is to raise money to support HIV/AIDS services, increase awareness and knowledge of the disease and provide a positive experience for people affected and infected with HIV.